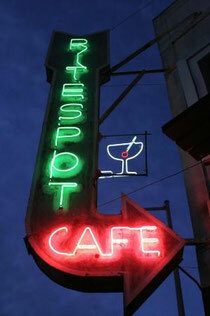 The Rite Spot Cafe is a bar in San Francisco’s Mission district. They had had a monthly comedy show there for a while, which went on until the bar was shut down for a year for renovations. Since reopening this Spring, they now host (free) comedy shows every Monday night. This was Trevor Hill’s show “Misery Index.” Trevor is one of my favorite comics in San Francisco. I met him before I even started coming into the city for comedy, back when he would make the trek out to Pepperbelly’s for the Wednesday night mic. He’s hilarious, smart, van deliver a rant with the best of them and I always enjoy seeing him work. He runs another great show “Hand to Mouth” at the Dark Room Theater, which you can catch this Friday or next month as part of Sketchfest. This was my first time at the Rite Spot and the place was packed. It was a good night. Everyone had strong sets from top to bottom. My set went well. Everything hit. I did 27 minutes, which really isn't much. It's fairly long for headlining a showcase, especially in San Francisco, but when you consider that the recording is going to be double that, it's not long enough to get a feel for the hour. I’ll feel better about it once I get a couple of longer sets knocked out on Wednesday and Thursday. Tonight is “It’s Just Two Minutes,” a monthly show that I co-produce. I’ll be opening up the show. I’m only doing 15, which means I’ll be doing the weakest fifteen minutes of material I have in an attempt to shore it up for the recording. It’s not going to be pretty. I mean it's going to be great! Pretty great! You should definitely come! A couple weeks back I was fortunate enough to work with Amy Schumer. Comedy Central is whisking her around the country doing a series of one nighters to promote her new show Inside Amy Schumer. Redding was the first city on the docket, but her regular opener missed his connecting flight. I've done a couple shows at the same venue with Jake Daniels (who runs a weekly Wednesday night show at Win River Casino), a comedy producer in Redding. In their scramble to find a last-minute replacement, they reached out to Jake, he called me up and we were in business. Amy was very nice, and she didn't have to be. She's out doing a national tour, selling out theaters, and promoting her Comedy Central show, and I was a last-minute local fill-in in the middle of nowhere. When I run into her in the future, and remind her that we did a show together, I'll bet she'll even be nice enough to pretend to remember me. The show was sold out, with over 900 people in attendance. That's about three times the size of any crowd I'd performed in front of previously. The room was was long and narrow. Those seated in the back were at least 200 feet away from the stage. For those of you familiar with my stand-up, you know that I'm not a guy who moves around a whole lot. I'm more of a stand-in-one-spot-and-talk guy. This was the first time I've ever been onstage and felt like I needed to be "bigger." My part of the show went decently. As an opener, your job is to bring the next comic up to an excited, energetic crowd. It was an ok set for me, but I did my job. And as Amy took the stage, she said, "You were funny." which is the equivalent of acknowledging that I was, in fact, an actual comedian. An hour after the show, we ran into each other at a gas station. And you know what, guys? She totally remembered me.